This verse, however, only answers the question we put to it. Which means the question we ask of it is quite important. Does this verse describe the earthly ministry of Christ? Or does it describe his non-repeatable, sacrificial act on the cross? Put another way, is this prescriptive of Christ's ministry, and hence the church, or a standalone, unique activity by the Son of God? I am quick to associate with the later position. I do not believe the two ideas need to be pitted against each other but I find Christ saying "my ministry, kingdom, and eventual death is for these." This is not something a covenant community would be expected to pick up and carry. This also would not have been surprising to a student of the law. Sacrifices in the Old Testament were for those who had committed sins. A select spotless sacrifice could save the sinful. A spotless Christ could save the lost. The fault of the religious people in Jesus' day was not that they were too focused on the law but that they were neglecting the most important part: the grace of God found in sacrifice. Christ came to demonstrate that the Messiah saves sinner. And then He did in fact save sinner. The church's mission is to proclaim that Christ did in fact, once for all, save sinners. Recently, this concept has been helpfully illustrated by Tim Chester in A Meal with Jesus. Before the cross Christ was about eating and drinking with sinners. These were the precursor indications of who he would go to the cross for. This again should not have been surprising to student of the law. The passover sacrifice was central to a meal. Many elements of the sacrificial system indicate meal-like qualities (this explains the explicit meal-sacrifices of Judges). Christ ate with those who would eat him. This is how Christ makes himself known. In language that echoes passover and the feeding of the five thousand, Christ makes himself known in the breaking of bread. Just as he has revealed his ministry and kingdom at the table for sinners, so now he reveals his risen identity through a meal. This is why the church has historical concluded its service with the supper. A reminder of God's manner of creating His kingdom. It establishes the kingdom in the midst of the church and then sends the church out. 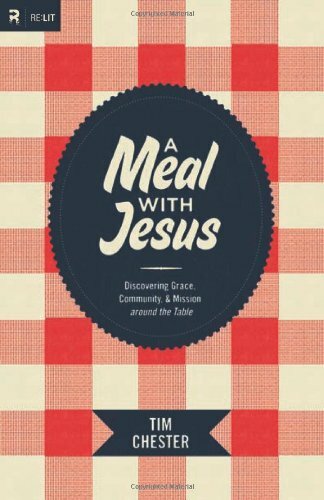 Thus the church should focus on the simplicity of meals as an outworking of vocation. Vocation is the key to accurately seeing no division between sacred and secular. Eating is the outworking of vocation. We work to provide for our families. We expand the family of God by including people in our meals and inviting them to the Lord's table.